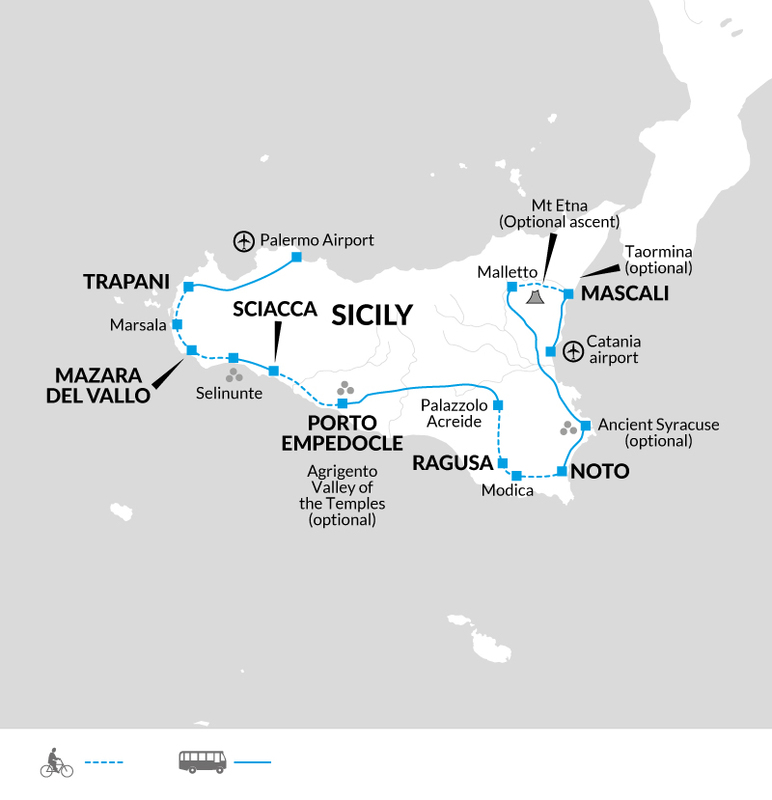 A varied and scenic journey by bike and bus discovering the highlights of Sicily. We cycle along a ruggedly beautiful coastline, discovering traditional fishing ports, fascinating ancient Greek ruins and inviting beaches. Ride between beautiful Baroque towns before culminating our journey with a ride around the flanks of Mount Etna. Our trip starts today in lively Trapani. We recommend a stroll to explore the 12th century, pedestrianised historic centre. If arriving earlier today you may choose to take the cable car up to the ancient town of Erice, said to have been founded by exiled Trojans, for impressive views of the coastline. Tonight will be your first opportunity to sample Sicilian cuisine and wine. Despite being just a couple of miles from the mainland, Sicilian wines have a rich viniculture all of their own and the island is the second largest wine producing region of Italy. After breakfast we spend some time getting comfortable with our bikes and making any necessary adjustments. Our first ride heads south as we make our way around the western tip of Sicily. Close to Marsala we cycle through the salines or salts flats - a patchwork of shallow coastal lakes and salt pans lined with ancient windmills - where we can learn more about the traditional process with a visit to a family-run business and museum. We should reach Marsala town itself around lunchtime and there will be a chance for an optional tasting at Florio to try the famous fortified wine. Our route continues after lunch, cycling along the coast to Mazara del Vallo where we spend the night. Founded by the Phoenicians in the 9th century BC, Mazara became an important commercial harbour and centre of learning in times of Moorish rule and the city centre, known as the Kasbah, retains Arabic architectural influences. As with much of Sicily, later influences from Normans through to the Baroque can be seen throughout the old city and its port gives shelter to the largest fishing fleet in Italy. Our total cycling distance today is approximately 68 kilometres (310 metres total accumulated ascent and 345 metres descent). After breakfast we leave Mazara and start cycling, along or close to the coast, to the vast site of Selinunte. Perched on a plateau overlooking the sea, Selinunte was the most westerly of the Greek colonies, and became a powerful and wealthy city well over two thousand years ago. We plan an unguided visit to explore the ancient city where tumbled ruins litter the landscape and one of its main five temples has been partially re-erected. Selinunte was eventually razed by the Carthaginians in 250 BC, after which the site was effectively abandoned. Next we drive for around 40 minutes to reach the laid-back port town of Sciacca. The local hot springs brought early Greek settlers and the town's name is most likely derived from the Arabic words 'from the water' (Xacca). We will explore the old part of town on foot while the bus takes our luggage to the hotel. Our total cycling distance today is approximately 45 kilometres (280 metres total accumulated ascent and descent). We leave town by bus this morning and our first visit is to Castello Incantato, a quirky sculpture garden, before we drive another short distance to the start of today's ride in Seccagrande. Our final cycle route in the west of Sicily alternates seascapes with sections further inland, encountering a few more inclines than the previous days. After stopping for lunch at a wonderful beach near Eraclea Minoa we continue riding to our hotel in the small town of Porto Empedocle overlooking the Strait of Sicily, with Tunisia just 90 miles away, and an ideal base to explore nearby Agrigento. Our total cycling distance today is approximately 52 kilometres (650 metres total accumulated ascent and descent). Today has been left free to relax and explore. The outstanding Greek ruins of Agrigento are just a short taxi ride away and once formed one of the most prosperous cities in Sicily. The ancient Acropolis, now a modern city, overlooks the southern ridge where seven Doric temples stand providing a perfect and evocative setting as the golden-hued temples encircled by almond and gnarled silver-grey olive trees look out over the sea. The Temple of Concordia is thought to be one of the finest examples of Greek civilization existing today. This afternoon we recommend a walk along the beach from Porto Empedocle to the impressive Scala dei Turchi white cliffs that have been eroded into curious layered forms. Its name means 'Stair of the Turks' and most likely derives from the frequent coastal raids carried out by the Saracens. We start the day with a scenic drive, swapping the seascapes of the past few days with landscapes of the interior in the south eastern corner of the island. After around 3 hours we reach the lovely town of Palazzolo Acreide. Although its roots are much older, the town was largely destroyed by an earthquake in 1693 and much of what we see today was slowly rebuilt in the following centuries including a number of impressive Baroque palaces built by wealthy noble families. The pastry shops here are famously good, employing centuries-old traditions using local crops such as almonds, walnuts, pistachios, honey and oranges. Back on the bikes, today's ride leads us through beautiful valleys amid the rocky peaks of the Iblean Mountains, finally climbing into the highlands to reach the magnificent hilltop city of Ragusa. As with every other place in the region, the old town collapsed in the 1693 earthquake and a new town, Ragusa Superiore, was built on top of the hill. The oldest part of town, Ragusa Ibla, was rebuilt by the old aristocracy and upon arrival we will explore the narrow alleyways, baroque palaces and charming piazzas on foot before heading to our hotel for tonight. The two towns were later joined and became the provincial capital. Our total cycling distance today is approximately 35 kilometres (660 metres total accumulated ascent and 880 metres descent). After breakfast we cycle from our hotel on scenic roads and after about an hour we reach another Sicilian Baroque gem in Modica, nestling at the foot of a deep gorge. Also famous for its Aztec-inspired chocolate introduced during the Spanish rule of the island, we plan to visit a traditional chocolatier. Our ride continues as we descend along a ravine to our next stop in Scicli. We will stop for a coffee and to explore this charming town. Those familiar with the Italian TV series Inspector Montalbano will be able to visit some of the places featured in the show. Cycling further south we will stop at Gli Aromi to learn about the use of endemic plants and aromatic herbs in medicine and cuisine. Our final stretch on the bikes is a descent to reach the sea at Pozzalo. A short drive brings us to Noto where we spend the next two nights. Noto is possibly the most beautiful Baroque city in Sicily, completely rebuilt between 1715 and 1780 (following the devastating 1693 earthquake) and still preserves a unified and homogenous architectural style and town plan, little affected by later developments. Its tufa stone has mellowed to a golden brown colour and its unique buildings leave visitors with an impression that is hard to forget. Sicily makes some great sorbets and you may like to try a local variety made with almonds, often served with a brioche. Our total cycling distance today is approximately 51 kilometres (500 metres total accumulated ascent and 980 metres descent). Today has been left free to relax and explore. There is plenty in Noto to keep you entertained for a day but for those interested we recommend a visit to Syracusa (45 minutes away by train). A colony of Corinth, it once rivalled Athens as the most important and beautiful city in the Greek world. You can visit Neapolis Archaeological Park with its famous Greek theatre hewn out of the hillside and the fine Roman amphitheatre where gladiators once fought. The small island of Ortygia is linked to the mainland by bridges and you can explore the atmospheric narrow streets to find landmarks such as the Fonte of Aretusa, Temple of Apollo ruins, Maniace Castle and the Jewish Quarter with its old baths found under the Residenza Alla Giudecca Hotel. Ortygia Island is also a great place to go to a local cafe or restaurant and sit and watch the world go by. Perhaps try cannolo, a traditional Sicilian dessert, a crisp shell filled with sweet ricotta and chocolate chips topped with candied fruits. Leaving Noto after breakfast we drive north for about 2 hours around the western side of Mount Etna to reach Malletto. It is from here that we start our last cycle ride around the northern flanks of Etna with a downhill bias and fine views of the mighty volcano as we make our way around to our hotel in Mascali close to the sea. Standing at around 3330m Etna is one of the most active volcanoes in Europe and the largest outside of the Caucasus. Etna is derived from the Greek word for 'I burn' and its craters and form has constantly been changing through numerous eruptions. In 1928 a lava flow almost entirely destroyed the town of Mascali. Our total cycling distance today is approximately 57 kilometres (340 metres total accumulated ascent and 1350 metres descent). Today has been left free to relax and explore. This morning, you have the opportunity to join a tour to explore the lunar landscape, craters and lava fields of Mount Etna. We drive from our hotel to the cable car base at Rifugio Sapienza, which is on the south side of Etna and 1,900 metres above sea level. Here there are several cafes and gift shops and you can also see the old Silvestri Craters. From here you can board the cable car up to 2,500 metres where you can have a walk around or take a 4WD coach drive up to 2900 metres to take a short walk (around 45 minutes) with a mountain guide to view the craters formed in the 2002/3 eruptions and the fumaroles at around 3000 metres, which is as close to the summit as we're currently permitted to go. In the afternoon you may choose to visit Taormina, Sicily's most famous resort - a favourite place during the days of the 'Grand Tour'. The Greek Theatre offers possibly the most famous view in Sicily - with snow-capped Etna acting as a backdrop to the remarkably well preserved columned stage. Day 11 - Trip ends in Mascali. The tour ends in Mascali this morning after breakfast. Arrivederci Sicilia! Due to the volcanic dust and sulphur fumes on Mount Etna, we ask asthma sufferers or customers with heart conditions of any kind to take these factors into consideration when deciding if this optional excursion is right for you. Due to the colder temperature on Mount Etna it's possible to hire equipment at the top of the cable car: Quilted jackets €3.00 per person and walking boots €3.00 per person. In windy conditions the cable car might not be running, in which case the four-wheel drive coach normally operates from 1,900 metres up to 2,500 metres. On all Explore cycle holidays we strongly recommend you bring along and wear your cycle helmet. In case of an accident resulting in personal injury, certain insurance policies are invalidated in cases where a helmet was not being worn. Accordingly, we recommend approximately GBP 15 per person for tipping. Italy: Visas are not required by UK, Australian, New Zealand, US and Canadian citizens. Other nationalities should consult their local embassy or consular office. 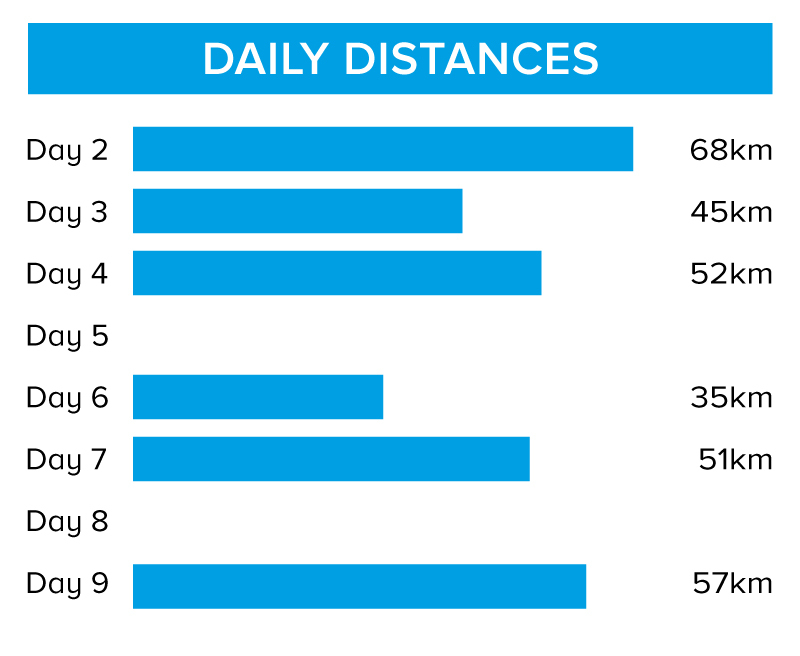 On this tour we cycle 308 km over six days (an average of 51 km per day). We generally cycle on quiet tarmac roads except for 2km of good quality dirt road on day 9. Days 2 and 3 are on flatter terrain with small climbs and other days are on undulating terrain with more pronounced but short uphill sections on days 4, 6 and 7. Each day a support vehicle (with room for 2 passengers) carries the luggage from point to point, accompanying the ride wherever necessary while the Explore Leader cycles with the group. On the final ride the Leader drives the support vehicle and provides clear directions to follow. We have graded the route as moderate. 27 gear Stevens Galant SX or similar hybrid bike.